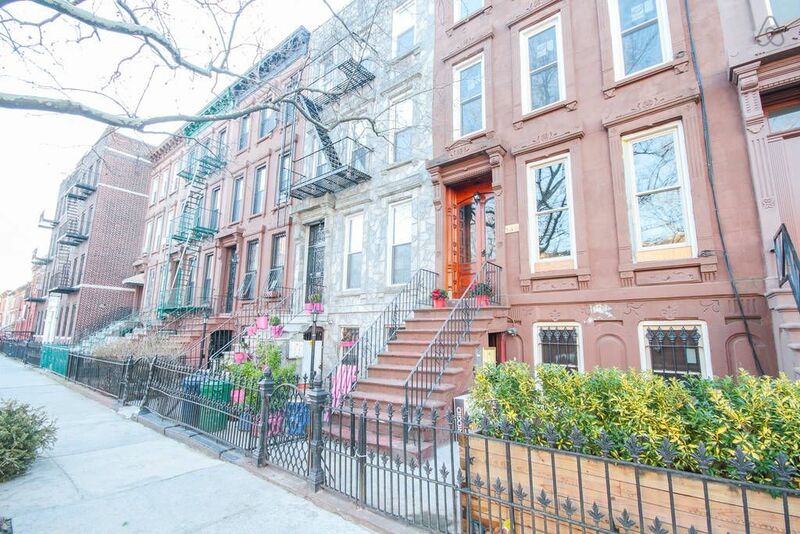 This is a COMPLETELY PRIVATE TWO BEDROOM APARTMENT WITHIN A HISTORICAL BROWNSTONE BUILDING. This property is located 3 blocks (5 minute walk) from the A Express or C Local Subway Station. This subway train allows our guests to get to DOWNTOWN IN 15 MINUTES AND Time Square in about 25 minutes. We DO NOT allow smoking IN, NEAR, or AROUND our Brownstone. * DINING tables seats 4 comfortably. Bar Height Breakfast bar that seats an additional 2 guests. Variety of restaurants and grocery stores nearby and laundry/dry cleaning around the corner. Metro PCS and T-Mobile stores are on Fulton St for sim cards and phone cards. Our property can be accessed 24 hours per day without the constraints of waiting for a property manager. The owner of the property lives in the 1st floor apartment. On RARE occasions, you may meet the owners from time to time. We are very friendly and happy to answer any questions that you have. I am the Office Partner who has been fortunate enough to have lived in 3 different countries where my addiction for diverse cultures grew. After a successful career in Europe, I am now focused on living my dreams in the US. Living in the US offers an unbelievable canvas to live out DREAMS! I started managing this Property in 2013. I remember when I had to rent hotel rooms for extended periods of time. I always wondered how great it would be to have a bigger space to enjoy. The thought came to LIFE and now I am apart of OFFERING a better experience to many others. We OWN and OPERATE 6 different HOME VACAY properties from the west coast to the east coast. We have over 90 FIVE STAR REVIEWS across Homeaway and other HOST Vacation Sites! Haven’t returned my deposit. I’ve tried emailing multiple times with no response. Homeway has also tried corresponding to no avail. Extremely Unprofessional. Homeaway has contacted this guest to deal with their issue. The owner or host had nothing to do with them not receiving their deposit. The owner never placed a claim for damage to the property, so this guest should have had no issue with receiving their funds back. As the owner, we have contacted the guest and Homeaway on behalf of the guest Homeaway has promised to resolve this with the guest directly. We have done all that we needed to do for them to receive their deposit. In terms of the guest themselves, we are not surprised at their note. They were a guest from H E double hockey sticks. We would never rent to them again and we warn all hosts considering. very nice apartment in a quit neighboorhood close enough to Manhattan. Stayed here for an extended weekend with another couple. Close and convenient to the subway. Flat had everything we needed and more. Would definitely stay here again! You won't be sorry if you rent this apartment. Very nice historical Brownstone with lovely neighbors. Close to subway and 20 min Subway ride to Manhatten and 1 hour to JFK. Good value for families or small groups traveling together. Be sure to eat at Peaches. This is a private little place at the top of a historic Brownstone. We were very comfortable here. Using the subway was fairly handy to travel in and back from Manhattan. Judit kept us informed of details. If you would like to experience New York a little less like a tourist, give this place a try! We always like getting exercise by walking on our vacations, and this was a great opportunity for us to learn the subway system as well! Clean, comfortable and quiet. Plumbing in bathroom needs some attention- no shower knob to change temperature. This guest spoke with the OWNER regarding the shower fixture. It is incorrect that you can not adjust the temperature. The very top portion of the handle has been broken off by the last guest. We communicated this to the guest and they responded that they understood and the function of the shower was not an issue at all. Not sure why they felt the need to mislead on their review when they gave us a 4 star rating. We just want to make sure that guests are aware that adjusting and utilizing the shower is not a problem at this property. The ornamental portion of the shower that was broken off is on order an arriving within a couple of weeks. Brooklyn has transformed into a 'Must See' destination for travelers around the world. Brooklyn has been a proud home to many celebrities and influential figures such as Jay Z, Mos Def, Barry Manilow, Shirley Chisolm, Gregory Hines and so many more. Why not take time to understand how this thriving, architectural, and tree lined environment has enabled the powerful journey's among many folks from the past and present. Brooklyn is growing into a epicenter of diverse cultures interested in living and working within a community that promotes safety and a progressive lifestyle among all its members. Diversification within the neighborhood has encouraged massive commercial developments and small businesses by way of restaurants, shops, cafe's, and even galleries. To name a few specifically: Have a great meal at Peaches, Surf the internet and have coffee in Brooklyn Cafe, Enjoy a gourmet pizza with family at Saraghina, OR Share a wine or spirit with friends at Wine Therapy. Utica Ave (A) express is 5 Subway stops away from Manhattan. Rates are subject to change until reservation is confirmed. A reservation can ONLY BE CONFIRMED with a completed partial or full payment.